5 -2....................Alfa von der Weyermühle. 4,4,5 - 3,4..........Bingo von Ellendonk. 5,5 - 4,5.............Jago von Beelen. 4,5,5 - 3,4..........Cona von Niederkassel. 5,5 - 4,5,5..........Palma von Ellendonk. 5,5 - 4,5,5..........Satan von Ellendonk. 5,5 - 4,5.............Blanka von der Au. Shannon von der Weyermühle placed 12th at the D.V. Meisterschaft with 272 points and passed the ZTP with 1A rating for character and SG for conformation. Shannon's litter-sister, Snoopy von der Weyermühle, completed her Dansk Politihund Kåring (Danish Police Dog Certficate), rated V1 in conformation and was the foundation female for the Germania/Ascomannis Kennel. 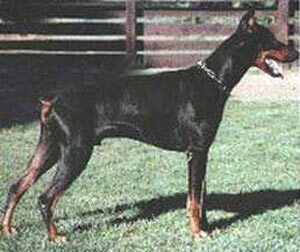 Shannon's sire, Doberwache's Amatzon, was a qualified SEK (SWAT & trained anti-terrorist dog) Polizeidiensthund, competed in the D.V. Meisterschaft and passed the ZTP with 1A rating for character and SG for conformation in 1995 while his dam, Hera von der Weyermühle, competed at the D.V. Meisterschaft in 1993 and also passed the ZTP with 1A rating for character.